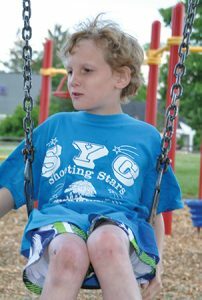 It was August 10, 2004 when we brought Ian to SYC. He’d been at Hampstead Hospital for a period of time and he was pale, lethargic, thin, and (in our opinion), over medicated. Hampstead was a dreary institution and we were so happy he was leaving there. However, we were also very apprehensive about his going to SYC. We were met by Lynn who eagerly welcomed Ian, showed us his room that she had just made up, and assured us that he would be well taken care of. We were told it would be 30 days before we could visit Ian, and we wondered how we’d be able to go that long. But he did very well, a trip to Storyland was planned three weeks in, and we were told we could meet the SYC group there and spend the day with him. We could not believe the transformation in such a short period of time! He was tanned from playing outside, energetic, and we saw that smile that we had not seen for months. We took a huge sigh of relief that day. Eleven plus years later, and our little man has transitioned into adult services. We want to thank every soul at SYC, past and present, who were a part of his childhood. There is no denying that Ian came with a unique set of challenges. Thankfully, SYC staff never gave up, never stopped trying, never ran out of ideas, patience, or suggestions, and never threw in the towel. We wish there was a way that we could thank each of you individually. There are probably many staff who know Ian that we have never met, but I would guess that Ian knows all of their names and what car they drive. There are several folks we have spent time with over the years that we feel made a deep and profound impact on Ian. Mike Schaffnit, the great Ian whisperer. Mike is an outstanding person. You cannot have this kind of connection with another human being unless you truly care. Jacob Kleckner, his outstanding academic teacher. Jake’s energy and thinking outside of the box mentality has made Ian’s past academic year his most productive year ever. Brian Doyle, or “DOYLE!” as Ian calls him, another outstanding individual who seems to truly love his job. Aja Rule, whose bubbly personality and smile we always looked forward to seeing prior to our meetings. Michelle Lang, a woman who became a true friend and mentor to Ian, not just his caregiver. She is one of the few staff who has been with Ian his entire stay at SYC. She has had such a huge impact on him. The entire Nursing Staff who dealt with broken fingers, broken toes, teeth extraction, you name it. All of the Residential, Academic, and Rehab Staff who showed such patience and understanding. All of the Family Workers we have worked with over the years. The Maintenance Staff who took the time to interact with Ian and keep SYC looking beautiful. The Food Service folks who got him to eat salad! So many people that we owe so much gratitude to.